MCCC President Jianping Wang, left, and Rider President Gregory Dell'Omo shake hands after signing the agreement. WEST WINDSOR – Students attending Mercer County Community College (MCCC) can now experience campus life at Rider University as part of a new housing partnership between the two institutions. The formal agreement — one of several signed on Dec. 14 at a ceremony on Mercer’s West Windsor campus — allows Mercer students to live in Rider’s residence halls at a reduced rate. As campus residents, the students will have full access to the University’s resources, including libraries, dining halls, and exercise and sports facilities. They will also be encouraged to participate in Rider’s 150 student clubs and organizations, intramural sports and on-campus events, such as concerts, musicals and Division I athletic events. The housing agreement applies to both domestic and international students. For those who decide to continue their education at Rider toward a bachelor’s degree, the University will offer tuition discounts in addition to the reduced housing rates. Three new program-to-program agreements were also signed at the ceremony, strengthening the ties between Rider and Mercer and offering more opportunities for students seeking full junior-class admission to Rider after earning an associate degree at Mercer. The agreements guarantees transfer admission of Mercer students who complete an Associate of Arts in dance to Rider’s Bachelor of Arts in dance performance; an Associate of Applied Science in advertising and graphic design to Rider’s Bachelor of Arts in graphic design; and an Associate of Science in Business Administration to Rider’s Bachelor of Science in Business Administration (accounting). 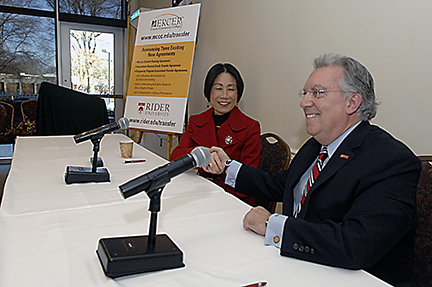 Mercer is Rider’s largest articulation partner. The new agreements raise the total number of programs available to transfer between Rider and Mercer to 28, creating more educational opportunities than ever for Mercer students who want to complete their bachelor’s degree. At the ceremony, Mercer and Rider also officially signed a guaranteed reverse credit transfer agreement. This allows students currently enrolled at Rider to complete the necessary credits towards an associate degree that would be awarded by Mercer. In addition to presidents Dell’Omo and Wang, more than 30 faculty members and administrators from the two institutions attended the signing.